Daily Life is so much hustling, full of long to do lists and tight deadlines, sometimes it's just time for a break, time for holidays! 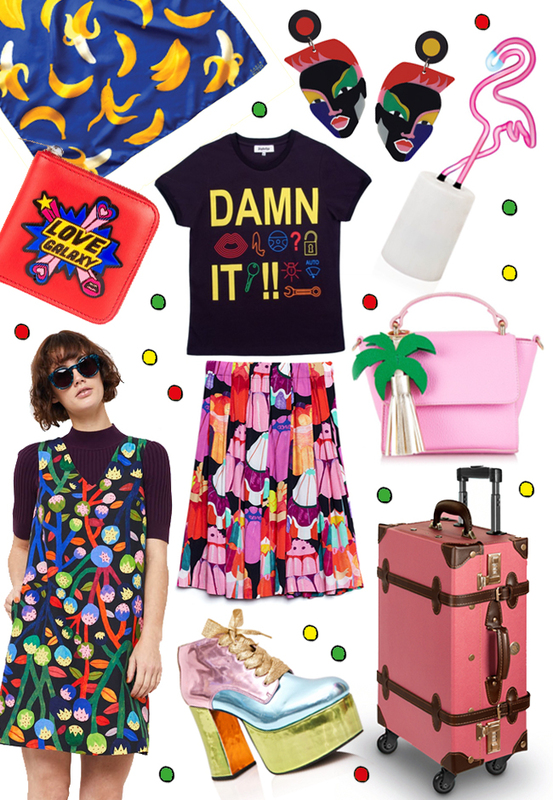 I am ready, and this wish list is what I am missing to pack my dream wardrobe. Holidays are the best time of the year in my opinion (and I bet you agree). But while others crave for wearing only swimsuits for three weeks probably, I feel the need to dress up brighter than usual and wear the coolest looks I can imagine. Who doesn't want to look good on the holiday pictures and while discovering new places in a foreign country? While there are many holiday shopping lists out there, most of them don't mention the way you transport your wardrobe: I say that you can only travel in style when you have a stylish suitcase! I think instead of buying another swimsuit (while having loads already) is's wiser to invest in a proper suitcase and I am in love with this pink beauty. All the stunning things deserve to be transported in a lovely case, and it's easier to find it again at the airport if you don't have number 1293 of the ugly black suitcases. Those earrings are super fun! These are sooo cool!! I love that Galaxy Wallet and the Flamingo Neon Night!! I have to agree that pink suitcase is dreamy!! Recent Post: Enter our Blippo Giveaway!